We support customer programs with a full range of development services from excipient compatibility testing and analysis. Services include formulation design and optimization, process development, and qualitative and quantitative evaluations. Full analytical services including method development, stability and testing is in place at each of our integrated product design, development and manufacturing sites. Our Rapid Advancement Process utilizes a number of tools to accelerate feasibility and early development studies while conserving precious active pharmaceutical ingredient. Integrated capabilities from rapid feasibility assessments through clinical and commercial manufacture ensures an overall rapid-to-product solution for Capsugel clients. Powder-in-capsule (PIC) studies using Capsugel’s proprietary Xcelodose® Precision Powder Micro-Dosing Systems have been shown to reduce early development time by 13 to 17 weeks. The Xcelodose systems are the industry standard for micro-dosing, given their unparalleled speed, low dose fills (to 100 mcg), and fill accuracy (1% to 2% RSD). By eliminating the need for excipient compatibility and dissolution studies for Phase I and II clinical trials, faster drug screening can be achieved. Capsugel has isolation equipment and protocols in place for handling highly potent compounds. 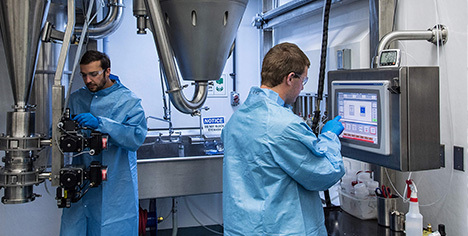 In-house micronization capability at all phases of drug development – from laboratory feasibility assessments through Good Manufacturing Practice (GMP) development, clinical and commercial supply – is an additional tool for rapid advancement. A full range of jet-milling equipment, as well as nanomilling capability, is used to optimize API particle-size distribution. High-containment capability is in place for both development- and commercial-scale micronization services. Based on our experience and investigation of thousands of challenging compounds, Capsugel has developed models and reference maps that are based on key physicochemical properties identified as critical for choosing enabling technologies. Specialized equipment (e.g., lab-scale particle spray dryers) and micro-scale testing methods have also been developed for feasibility studies. These tools enable Capsugel scientists to rapidly conduct feasibility assessments using the optimal, phase-appropriate formulation approach. Feasibility screening can typically be performed with minimal amounts of API, typically with 200 mg or less – a critical consideration for many clients working with early-stage new chemical entities. Formulation optimization and scale-up is performed only after demonstration of feasibility. Clinical-trial manufacture is available for drug product intermediates (e.g. micronized API, spray dried dispersions, or multiparticulates) and a full range of solid oral dosage forms including tablets and encapsulated liquid, semi-solid and solid formulations. Primary and secondary packaging is available for clinical and small-scale commercial material. Clinical trial services include all labeling and assembly of CTM kits, as well as global distribution and logistics. We pride ourselves on an open and collaborative approach at every stage of product development. Our multidisciplinary teams make sure the dosage forms we design, develop and manufacture offer exactly the right product profile and are robust from a manufacturability standpoint at laboratory, pilot and commercial scales. Our scientists are grounded in engineering and the fundamental sciences. We use this expertise to complement the capabilities of our clients, bringing different perspectives to a common goal: advancing clients’ products. Ready to advance your product?